Regular readers of this blog must remember that I started a series called “Following my Heart”. In these series I write about my travels throughout the USA and ultimately when and how I became a knitter. I have been wanting to do this in chronological order but instead I will write about the highlights and lowlights for that matter, or whatever and where ever inspiration takes me. Today I feel it is time to tell you about my travels to Los Angeles. Barely recovered from my time in Chicago, I suddenly find myself in Los Angeles, California. Guess where exactly we staid..? 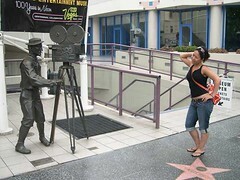 Hollywood! I remember how wide eyed I was and how I would soak in all the visuals that this exciting city offered me. 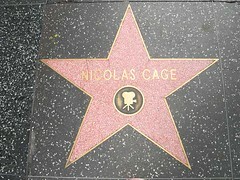 “Hollywood, I am in Hollywood…”, I would repeatedly say to myself as I walk down Hollywood boulevard all the while pretending that I myself am a moviestar. 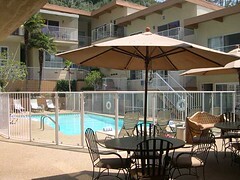 The best thing of my stay in Hollywood was the people I met in the courtyard of our hotel. Every morning I would claim my spot at one of the tables close to the pool and chatter with other guests. And what colorful characters these guests were! How eagerly I would listen to what brought them to Los Angeles. Danny, a young guy from NYC, had come all the way to Hollywood to become a p*o*r*n star. Will you believe me if I tell you that he even let me read the script he was supposed to memorize? Without blinking my eyes I flipped through it and congratulated him with his part in the movie. Diane, a professor in english literature and recovering alcoholic, had written a script about her life and was trying to sell it to this crazy cigar smelling movie director. On the day of their meeting, Diane was so nervous and seriously needed a drink. I told her that was out of the question. But when I saw the crazy cigar smelling director walk into the lobby of the hotel, I turned to her and said: “Let me get you a drink, Diane. I think you will need one”. How I enjoyed my time in Hollywood… We would go to beaches, have margaritas, be cheesy tourists and go on a bustour to the Hills in the hope to spot a celebrity. We would go to parties, watch the rich and beautiful and be amazed at the lifestyle they lead. I felt light as a feather and beautiful during that time in my life, everything was so super exciting and new. Not a care in the world I had; I had no work obligations, no study obligations… I was a woman of leisure. It is hard to imagine that I was not a knitter in those days. If you would have bumped into me in Hollywood and if you would have told me that I would become a knitter and would end up working in a yarnshop, I would probably have laughed at you and snobbishly would have replied: “Me knitting? Domestic arts and crafts? You have got to be kiddin’ me”. Thank you for reading and untill the next entry..! 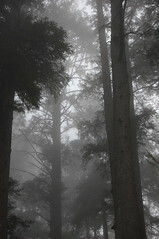 How I love early morning walks… The quiet energy just after sunrise has a certain serenity to it. No one is up yet, except me, and the world around me is in total peace. And how beautiful the world is when you find yourself high up on a cliff, surrounded by tall trees that play hide and seek in the morning mist. As I walk down the hill trying to get to the beach, I am struck by how gently and soothingly the grey mist touches my skin. If I would have felt frustrated or stressed out about a certain situation, I am sure this gentle touch on my skin, would have eased my worried mind. How I wish I could walk around with a little basket, reach out with my hand into the air and collect big flufs of mist, as if it were roving. I would then take my basket full of fluffy early morning mist to my spinning wheel and I would spin up the finest, most fluffiest lace weight yarn ever. 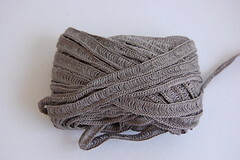 The color of my yarn would be light grey and I would knit a lace shawl with it. 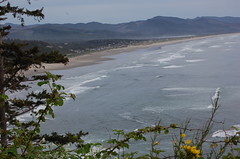 And every time I would drape the shawl over my shoulders it would take me back to that early morning walk high up on a cliff, somewhere at the Oregon coast. As I slip out of the realm of my imagination back into reality, I hear the roaring sound of breaking waves and watch the mist solidify into little dewdrops. 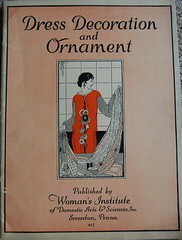 It is a booklet called: “Dress Decoration and Ornament”, published by Women’s Institute of Domestic Arts and Science, Inc. Guess in what year this little baby was printed? 1925! What a find…published in 1925! Sewing machine Pfaff Hobby 1142 …? Check! Woohoo! It was surprisingly easy, I must say. 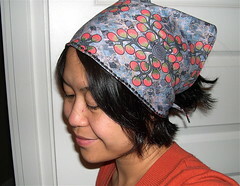 I just took a bandana I already had, put it on my piece of fabric and just lined it out while making sure I add an inch for hemming and cut cut cut I went. Then I simply folded the edges once and ironed a sharp crease for the hemline and repeated that once more. And then I just sewed it together. Really… it was that easy! While I was making my first tiny little sewing project, it occured to me how many tools were needed: scissors, iron board, iron, and sewing machine. 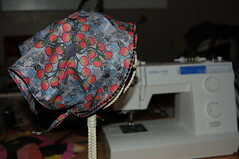 Before I could get started with sewing, I had to thread the bobbin, then thread the machine, then bring up the bobbin thread. However, since several weeks, I have been shyly visiting Bolt. 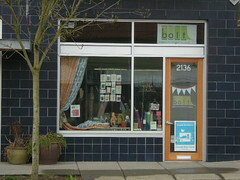 It began with gazing at the many bolts of beautiful, mostly cotton fabrics. Then after a while I felt confident enough to touch some of the material and soon enough I started to buy little pieces of fabric. The ladies that work at Bolt have been so incredibly nice to me! Always happily answering all kinds of questions that I have, telling me their story of when and how they become sewers and guiding me through all the bolts of fabric. 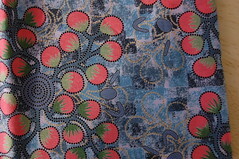 Because of their enthusiasm, and the beautiful material Bolt carries, I started to even buy more fabric. But I digress… after all, this is a knitting blog, eh? Nothing much to report, really… I finished the swatch with Karabella’s 100% laceweight ribbon, interesting to knit with for sure! But it is not particularly talking to me. The silk feels awesome though, I am glad I could swatch it up! 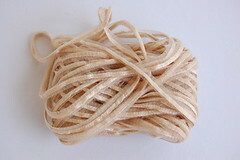 And besides that, I have never seen such fine ribbon laceweight and a 100% silk no less. My new found love is steadily growing… It looks like a blob of nothing, but man oh man, let me tell ya, I simply cannot wait to get to the blocking stage. I am drooling just by the mere thought of how the lace stitches will bloom in front of my eyes… And that, my dears, is what keeps me going on this lace project. 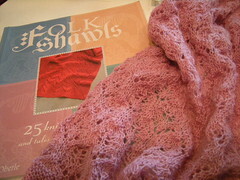 I distinctively remember how I stared in awe at the Kimono Shawl from the book Folk Shawls by Cheryl Oberle, while I was perusing Eunny Jang’s blog for the first time a couple of years ago. I could not believe that one could make such intricate and breathtakinly beautiful patterns with just two sticks and some strand. Really, it was beyond me, newbie knitter that I was. Right there and then, on the day that I first set eyes on Eunny’s Kimono Shawl, I promised myself that I would reach the level of honorable lace knitter. How convincingly determined I was, I also realized that I had to practice lace knitting and that baby steps were required. 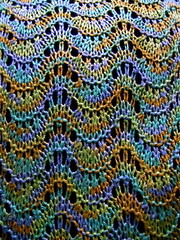 So you think you can knit lace? I endearingly smile when I think back how I bravely casted on 170 stitches with needle size #5. Really, I had no idea what I was getting into… and let me tell ya… it slapped me around. 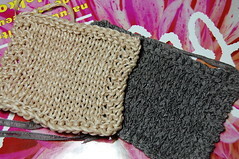 Back then, I had absolutely no deeper insight in why I had to to a knit two together (k2tog) or a slip slip knit (ssk). 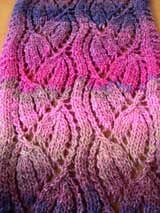 And of course like any newbie lace knitter, I would make a yarnover (yo) to few or too many in a row only to find out that I was off pattern at the end of a row. After several days of knitting the Kimono Shawl, I was amazed by how far I had gotten but my frustration level was so high that I decided it was not worth it. I carefully tucked my project away and forgot about it for the next 12 months to come. Those are Philosophy by Trendsetter and Tiziana by GGH. Both interesting yarns but the one that talks the most to me is Philosophy. 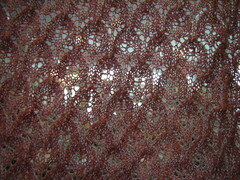 Right now I am knitting a swatch from Karabella’s Manipur, a ribbon laceweight. Oh and the choli you might wonder? I bumped into some problems… don’t want to get into it now… too technical. It would bore you to death, trust me. Back in Amsterdam I would have stacks and stacks of Hair Magazines and together with my roommate we would spend hours and hours browsing. I often wondered what attracts me so much to beautifully done hair and I think it’s the lines and curves I am most mesmerized with. To me it is aestethically so pleasing; lines going harmoniously this way or that way, curves and waves perfectly lined up in feminine silhouettes. 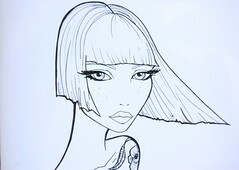 I love love love, Brenda’s work. Go check out her cafe press online store by clicking here. As for my own hair? Hairstylist Kassandra did a fine job, if I may say so. It is exactly what I wanted: flapper style bob cut with whisps on my cheekbones. In exchange for her work, I knitted her the Portia hat by Louisa Harding. Good deal. I am sorry to say that I did not enjoy knitting with this yarn. Because of the angora, it is quite fuzzy and besides that it shedded like there’s no tomorrow. Every time I worked with it, I was covered in angora hair and boy did it make my eyes itch and tickle my nose! Beautiful to look at, itchy to work with. No more angora for me from now on. I would like to end this post today with some interesting yarn I got in the mail from Yarn of the month club which is coordinated by knitwear designer Sara Lucas. I have been a member for a year now and I am always happy to receive little samples of yarns to try out. 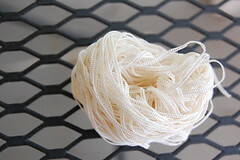 This particular batch was very interesting to me and I cannot wait to knit up little swatches. You are currently browsing the Getting Purly With It blog archives for May, 2008.